Workers started on the top of the Knights of Pythias Building on July 8. 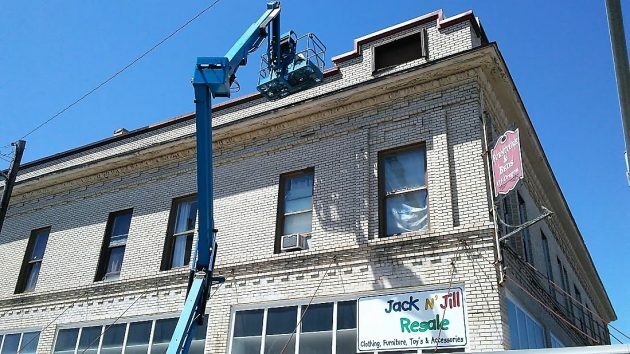 Structures in downtown Albany are getting dressed up this summer with urban renewal help from CARA, the Central Albany Revitalization Area. Last weekend I noticed that work had started on the facelift of the Knights of Pythias Building, 230 Lyon St. It was back in February that the CARA advisory board and city council, as the Albany Revitalization Agency, approved a $10,000 grant toward what was expected to be a $25,000 project. The building dates from 1913, and owner Daren Clowser wanted to have the exterior, including the historic windows, repaired and repainted. The project was approved under CARA’s storefront revitalization program. On Wednesday (July 19), CARA will consider another storefront restoration, this one at Hasty Freeze, 655 Lyon St. Owner Tony Pope is asking for a $10,000 grant to help pay for $21,445 in planned improvements to the iconic hamburger stand. The description with the CARA agenda mentions fixing the roof and “removing the overhang.” I’m hoping they don’t remove the overhang under which, while waiting for my order, I used to seek protection from the winter rain. Last month CARA supported another project in the Bikman Building. 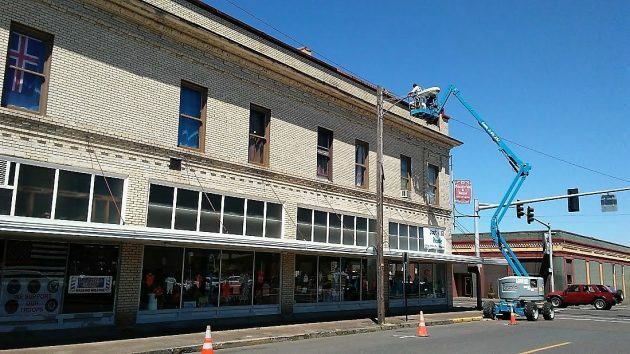 The advisory board on June 21 approved a low-interest loan of $10,000 to help Klint Sheets, a Lebanon police officer, open a brewery business in a vacant storefront on the First Avenue side of the building, at 136 First E.
Reaching high at Third and Lyon as the Pythias Building gets dressed up. Malls are going the way of the dinosaur. On-line shopping is sealing their fate. CARA may be prescient. What’s the annual income is, of these poor property owners, compared to Joe Citizen? Several years ago CARA had enough borrowing capacity to cover the entire cost of the new police/fire buildings. This would have spared the need for bond measures that were subsequently passed by a paltry percentage of voters. Now, every property owner will pay through the nose for many years. And CARA will continue to siphon tax revenue away from the other taxing districts to pay off CARA’s debt…with some of the debt proceeds being handed out in drip-drip fashion to these downtown cronies. (2) burdening local taxpayers with additional property taxes to pay for buildings that are needed much more than paint. Typical Albany politics…greedy city government + voter apathy = abuse. Isn’t it fabulous that Albany continues to grow & improve by using proven tools – in spite of the whining & complaining by the usual suspects. I do love it so!